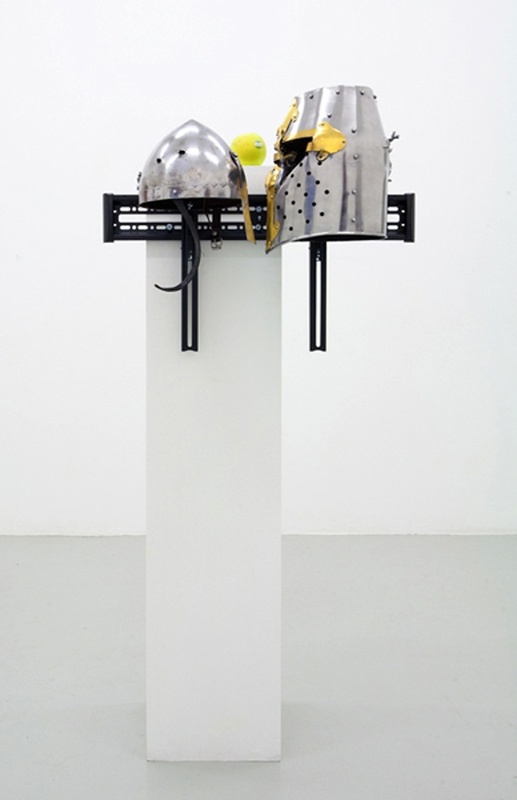 Fluxia Gallery presents “Legend”, the first solo exhibition in Italy of works by Timur Si-Qin (Berlin, 1984). For this project, Si-Qin activates the narrative potential surrounding the gallery by traveling to Oria, the hometown of Valentina, one of the gallerists. 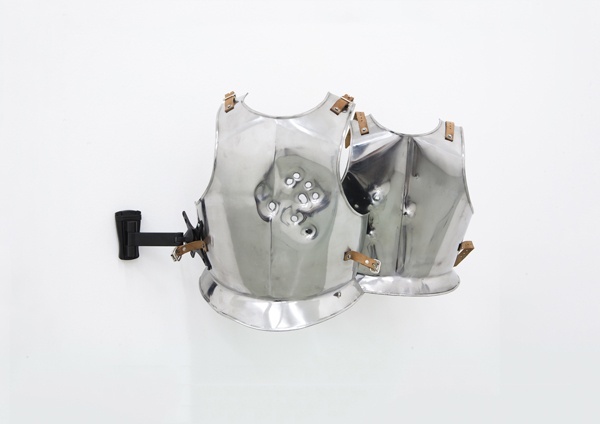 There he meets her father, Ennio, a medieval reenactment hobbyist, and proceeds to shoot a video of the gallerists (Valentina and Angelica) shooting modern firearms into the father’s pieces of medieval armor — a simulated anachronistic battle doubling as the act of artistic production. 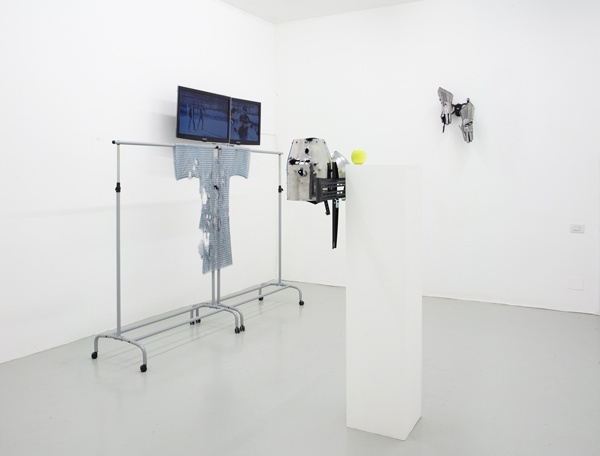 The video alongside the objects themselves are presented as works in the exhibition. “Legend” is a context-specific project, dealing not only with the gallery as a physical entity, but also as a personal, social and material space of interaction. These multiple layers of networks and the connections between them constitute a system of stories surrounding the gallery and the production of each exhibition, a narrative potential that plays a significant role in determining the exhibition itself, becoming a sort of invisible extension of the artwork’s medium. 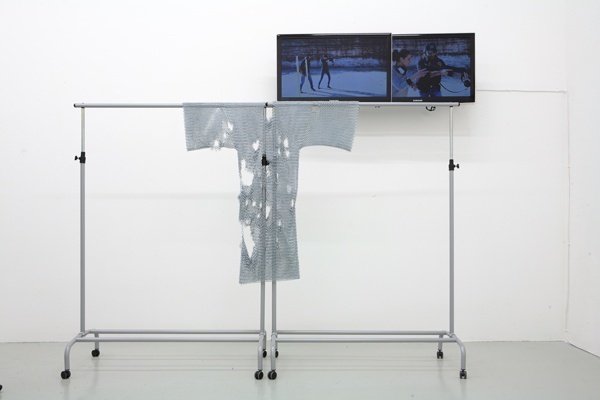 Starting from an interest in a biocultural perspective on art — namely a critical theory rooted in contemporary evolutionary theory — Si-Qin’s work develops a reflection on the mechanisms of art production and consumption, reliant on evolutionary themes in cultural artifacts and narratives. Drawing on the writings of biocultural theorist Brian Boyd, Si-Qin believes that patterned cognitive play, in the form of a secondary-narrative surrounding an exhibition, is the dominant stage and medium of contemporary art. Also that art and culture in general ultimately derive from an adaptive history of the human species and continue to serve an adaptive role today. The more “basic” narrative themes of culture, such as those involving money, violence, romance and family are dominant and hyper-represented in mainstream culture because of their inherent relevance to biological survival. Concomitantly the human brain is largely hardwired to detect and respond to that relevance and is therefore predisposed to pay attention to such themes. 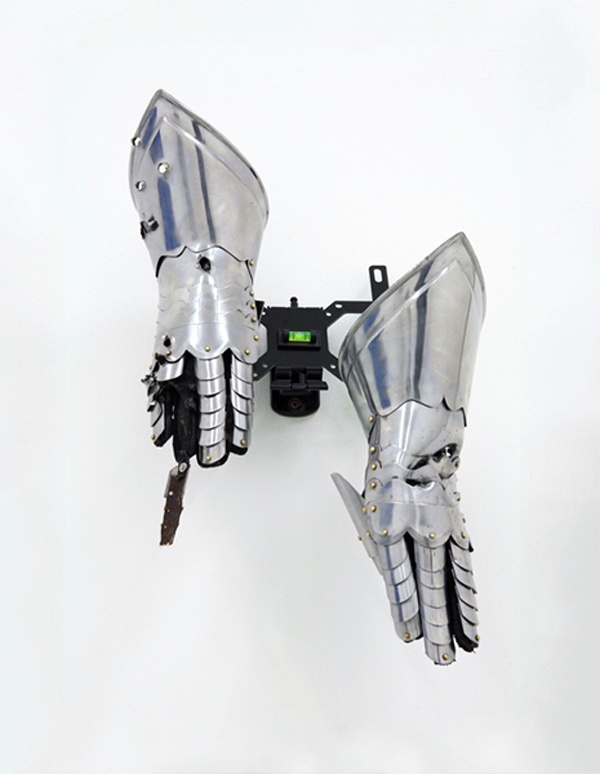 In a gesture of minimalism, Si-Qin uses these more basic themes in his work in order to signify and highlight the biocultural in general as well as benefiting from the material’s bio-cognitive ability to draw attention.